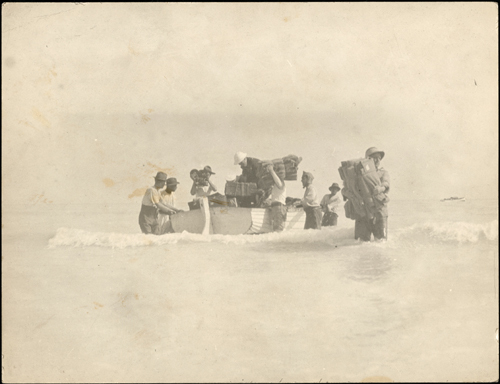 In late August 1922 a group of astronomers, naval men, and Aboriginal stockmen began the arduous task of unloading their complicated scientific equipment and stores from boats onto a deserted beach on the coast of Western Australia. The shallow nature of the approach meant the boats were anchored three or four miles from the high-water line and the stores, after being brought to shore, were then transported by donkey wagons to the observation site at Wollal. This was no ordinary expedition and its members knew the eyes of the world were on them waiting to see if they would be the ones to finally prove Einstein’s controversial ‘Theory of General Relativity‘. To do this they would have to photograph the light from stars bending around the sun and then measure their placement extremely accurately. At stake was the whole concept of universe as envisaged by Sir Isaac Newton over 250 years before. Everyone involved in the project was well aware of how difficult this task was and that they were only one of eight other astronomical expeditions who were also setting up their equipment at sites across Australia. The largest group of observers, based near the Wollal post and telegraph station consisted of three international parties, the Lick Observatory party, under the direction of W. W. Campbell, a group from the University of Toronto, under C. A. Chant and the Indian expedition supervised by J. Evershed. 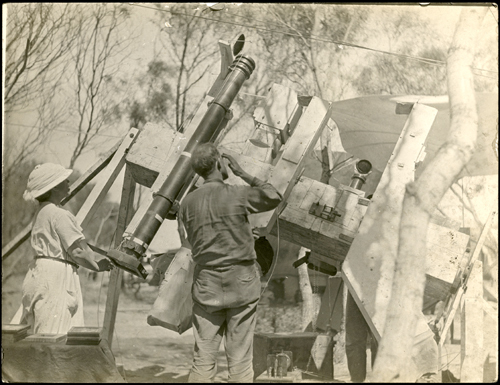 In addition Australia provided a fourth group from the Perth Observatory. They were directed Mr. Nossiter and included Mr. Nunn, Mr. Matthews, Mr. Dwyer and Mr. Yates. On top of this were four others set up on the east coast under the direction of the Sydney Observatory and W. E.Cooke. After being refused by his boss Freundlich wrote to William Wallace Campbell, a pioneer in solar eclipse photography, at the Lick Observatory in USA. He asked him to come to Russia and prove or disprove Einstein’s theory. As a result Freundlich and Campbell both made their way to Russia in 1914 with Freundlich setting up his instruments in the Crimea while Campbell sets his up near to Kiev. Unfortunately for everyone major political events unfolding in the background and bad weather destroyed their chances for capturing the event. On June 28 1914 Archduke Franz Ferdinand of Austria is assassinated and Germany declared war on Russia. As a result Russian officers seize Freundlich’s equipment, (in fact he and his assistants are held as POWs for a number of months afterwards). Campbell as an American is allowed to continue his project but unfortunately clouds obscure the eclipse and he not able to good photographs of the event. The limited viewing window for this eclipse made the United States a prime site for setting up his equipment but unfortunately the war made it difficult for Eddington to travel there. Instead he also decided to contact Campbell at the Lick Observatory and ask if he would be able to try one more time to photograph the eclipse. Campbell agrees but his equipment had been confiscated by the Russians in 1914 and this forced him to improvise from existing equipment lying around at the Lick Observatory. Thus it turned out that although Campbell had the solar eclipse observations all to himself he was forced to take his photographs using sub-standard equipment, and this was to have some serious implications for this story. On the 11 November 1918 World War One ended. This took away the restrictions on travel which had been holding back astronomers and as a result tEddington was free to travel to observe the next solar eclipse. The event happened on May 29 1919 and this time Eddington carved his way through the jungle of island of Principe (off the west coast of Africa) to set up his equipment. He spent a month there building the telescope but as luck would have it on the day clouds affected the view forcing Eddington to take his photographs in quick succession hoping all the time they caught the moment of full eclipse when the stars would be most visible. In a strange twist of fate Eddington’s cable confirming Einstein’s theory arrives in London at the same time as Campbell physically arrives to present his results, disproving the theory. As a result Campbell gets nervous again about the quality of the equipment and Curtis’s measurements and decides to again delay the presentation of his negative results to London’sRoyal Astronomical Society. Instead it is Eddington who on 6 November 1919 presents his positive results and word of this momentous decision spreads quickly spreads around the world. Very quickly Einstein becomes the face of genius and a world renown scientist – BUT still there many sceptics in the scientific community who questioned Eddington’s results and a backlash began, helped in part by anti-German sentiment in the wake of War. This time the weather and the equipment would provide optimal conditions for Campbell and his group at Wollal. In this photograph we can see the polar axis set up to hold the spectrographs, the Floyd telescope and the two short focus camera. The woman on the left is probably the wife of W. W. Campbell as during the eclipse she was responsible for the exposures of the solar corona by means of the Floyd camera. nal was a specially made 1.52 metre (5 foot) solar telescope camera named fittingly the ‘Einstein camera’. campbell himself directed this camera but looking after the changing of the glass plates was left to two Australian naval men, Messers. Rhoades and Kenny, under Commander Quick. It is quite possible that these are the two men seen here.